Filed to: Did LG actually make a good smartwatch?Filed to: Did LG actually make a good smartwatch? Did LG actually make a good smartwatch? Anytime Google does a big revamp to its smartwatch platform, it seems like LG is always close behind with new wearable to test out how good that new OS really is. Unfortunately, LG’s most recent attempt was kind of dud, but with the new W7, LG may have finally created something with a little more legs (or in this case, hands). Sporting old-fashioned mechanical hands, the W7 is LG’s first-ever hybrid watch. In addition to doing their usual tick-tock business, the hands can be used to indicate various things including altitude, air pressure, compass directions and more. Inside, there’s even a honest-to-goodness gearbox made by Swiss group Soprods SA to deliver actual mechanical movement. This is what the W7 looks like in watch-only mode. Those hands aren’t just for show, because depending on what you’re trying to do, they move to show which direction north is, or they’ll wiggle around to let you know someone has sent a text. And if they ever get in the the way, a long press on the main button on the right will let you move them out of the way. 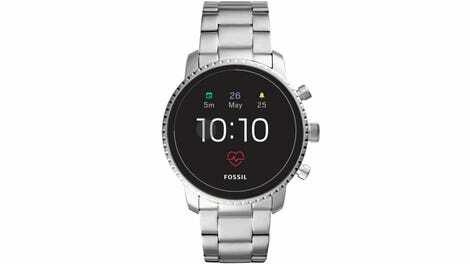 Meanwhile, the 1.2-inch touchscreen behind the hands gives you access to the rest of Wear OS, including Google’s recently revamped health and fitness tracking, its more streamlined UI, and improved notification system. The watch’s case is made out of stainless steel and features IP68 water-resistance that should make it immune to most encounters with moisture aside from an all-out swim. It also has a heft that you don’t normally find in your average smart device. And to make sure the watch will always be able to meet its basic requirements, LG created a special watch-only mode that lets the W7 last for 100 days between charges. In normal use, LG says you can expect closer to two full days of life with all of its features turned on. Sadly, the W7 comes with a number of caveats. 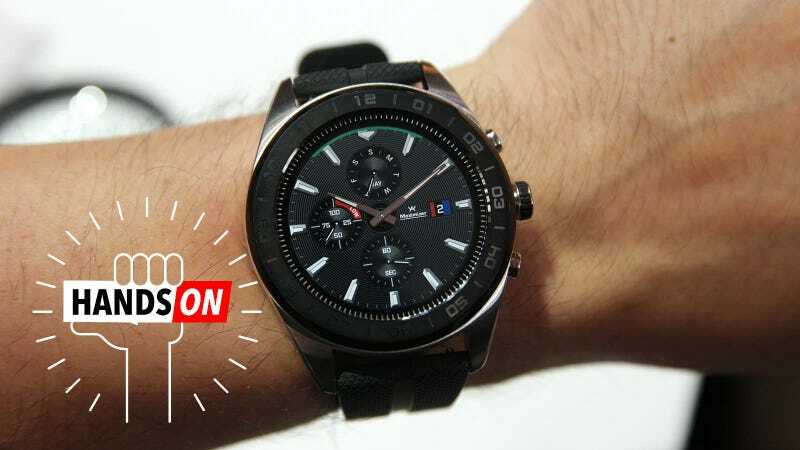 Instead of featuring the Qualcomm’s recently announced Snapdragon Wear 3100 chipset, LG opted for the same tired Snapdragon 2100 processor Wear OS device makers haven been trotting out for the last two years. These are LG’s special selection of Master apps. This seems like a ridiculous move, because you have to imagine that based on previous partnerships, LG knew Qualcomm was working Snapdragon 3100 was on its way months ago, and instead forged on with inefficient silicon that will be outdated the moment it gets released. The W7 also doesn’t have heart rate monitoring or any sort of standalone LTE functionality, and at $450, the LG W7 (available October 14th) costs $100 more than an equivalent Samsung Galaxy Watch, and aside from those mechanical hands, the W7 seems to have less features than the Galaxy Watch too. Maybe getting to use one for longer will change my mind, but for now, I’m both intrigued and skeptical. The watch looks and feels pretty nice, but $450 is asking a lot for not a ton of features.